Take your optics lessons outside the classroom. This light and laser education kit was originally developed for SPIE student chapters so that University students could share what they know about light, lasers and optics with kids in grades 3-12. If you do outreach, after school programming, lead a museum program for kids or just want to get started in the classroom with alight and laser education kit, this is the kit for you! Conduct 10 exciting, engaging demonstrations and activities to get kids ages 10-18 interested and involved in the fascinating STEM subject: Photonics. 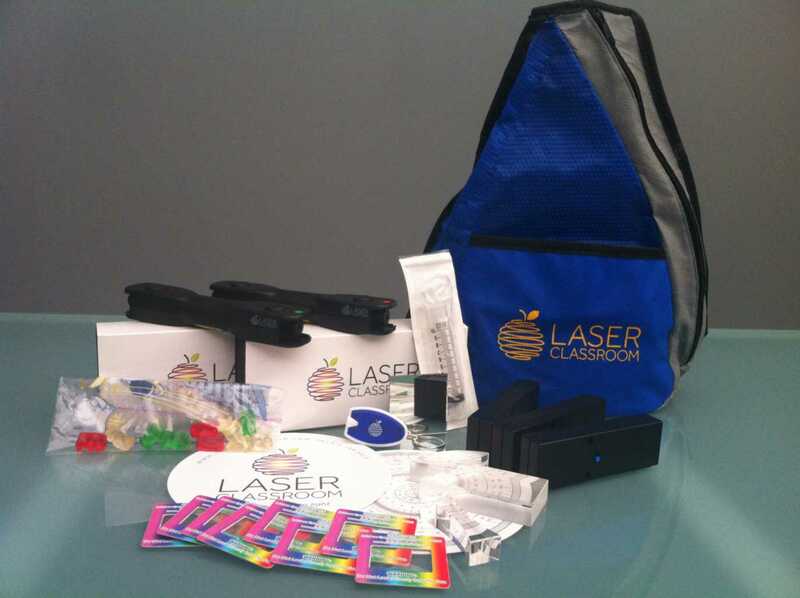 The light and laser education kit is equiped to support your teaching and learning about reflection, refraction, diffraction, magnification, fluorescence, color blending and more make this versatile and portable kit easy to use with almost any group of kids, in or out of school. Ordering information: Light and Laser Education Outreach Kit includes 3 LED (red, green, blue) lights with line generating caps; a white LED; One each red and a green LASER Blox™; Set of 3 lenses (convex, concave and trapezoidal) ; 3 mirrors with supports; 10 protractors; and 10 diffraction gratings.